In Planning Ahead to Plant Garlic we wrote about preparing the soil before it was time to plant garlic. The time has come. Here’s how to plant garlic! It’s a little consuming but it’s not at all difficult. You’ll need part of a day when it hasn’t been raining. You want the soil to be moist but not wet. Garlic needs time to settle into the soil and establish roots but not so much time that it can sprout before the soil freezes. Sort through your garlic bulbs ahead of time. 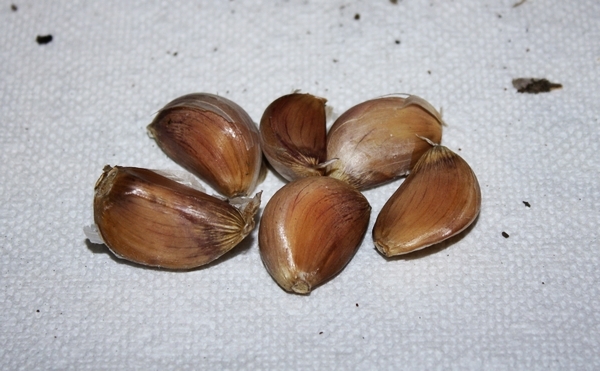 Separate the bulbs into cloves, discarding any that are spoiled or too small. Starting with large, healthy bulbs will get your future garlic harvest off to a good start. Amend the soil. Garlic is a heavy feeder. Add a two to three inch layer of compost to the soil and work it in. Or, add three pounds of 10-10-10 fertilizer to a 100 square foot area to the soil and work it in. Mark two inches on the dibble or dowel to eliminate the guessimating. If you’re like me you’ll carefully poke the dibble in the recommended one to two inches at first, then you’ll realize how long it’s taking and just start poking. “Close enough” ends up too deep. As long as my dibble is marked I’m good to go. Poke one to two inch deep holes in the amended soil, three to five inches apart. Rows should be 12″ to 18″ apart. 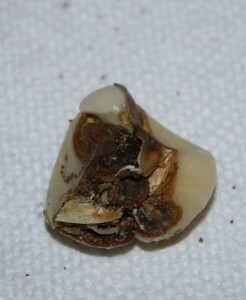 The pointed end of the clove is the top. The flat end is the root end. Drop one clove in each hole. I’ve found it faster to poke all of the holes I can reach at once, plant the cloves, then cover the hole than it is to do each one step by step by step. Do whatever works best for you, the garlic doesn’t care as long as it lands right side up. Cover the holes and water the soil deeply. This is the first and last time you’re going to water the soil this year so be generous with the water. Spread a six inch layer of straw over the rows. The straw helps to insulate the soil and prevent heaving caused by frost. I mulch the space in between rows as heavily as I do the actual row. Garlic doesn’t like competition from weeds. If there’s going to be high wind or it’s not going to rain within a day or two I water the straw to weight it down and hold it in place. A slow spray will allow the water to soak in without running off. If you can’t find straw you can use hay. Hay might add a few seeds to the soil but it will prevent more seeds from germinating so it’s worth the trade off. I tried mulching with leaves one year. It seemed fine in the fall but the cloves had a hard time breaking through the matted leaves in the spring. I had to pull them back to free the bulbs. And now you wait. You shouldn’t have to do anything with your garlic until spring. This entry was posted in Gardening, How-To and tagged Gardening, garlic, how to on October 27, 2014 by Homesteader's Supply.